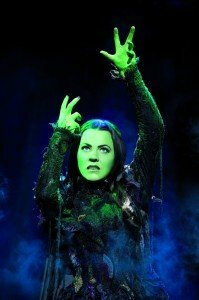 Rachel Tucker is a Northern Irish actress, who at the time of the interview, was starring as ‘Elphaba’ in the West End hit musical Wicked. She started singing and performing with her family at a young age and later trained at the Royal Academy of Music. Rachel was one of the finalists in “I’d do Anything’, the 2008 BBC talent show searching for an actress to play the lead role of ‘Nancy’ in a then upcoming revival of the musical ‘Oliver!’. This really got her career going. Rachel made her West End debut as ‘Meat’ in We Will Rock You (Dominion Theatre) in September 2009 and was also the first understudy for the role of Scaramouche. In March 2010, she took over from Alexia Khadime as ‘Elphaba’, in the popular West End musical ‘Wicked’ which tells the story of the Witches of Oz. Her brilliant performance as the (future) Wicked Witch of the West won her a 2011 Whatsonstage.com Award for ‘Best Takeover in a Role’. I have always sung but I was about 14 when I knew it was what I wanted to do as a career. You were one of the finalists on ‘I’d do anything’ in 2008. Would you share with us what kind of experience this was and how it has influenced your career? I loved my time on I’d Do Anything. It was a 3month whirlwind of many different experiences – of singing musical theatre songs as well as pop and group numbers. We also had a massive opportunity to learn how television works, how to play to the camera and we rehearsed so much that you and everyone involved knew that you could get it right in one take (most of the time!). There was a lot of pressure, of course, but the challenge was to be able to do it week after week and make it look like there was no pressure. But mainly, I loved the people I met – they are a great bunch of girls! How long does it take to put on Elphaba’s make-up? How would you describe ‘your’ Elphaba…can you identify with her, and if so, in what way? I think everyone can identify with Elphaba. Her character is written in the way that you feel you know her by her first line. She can give this impression of being very strong and not taking anything to heart, which we can all do, and then there are times when she lets her guard down. She lets you see how it hurts not being a normal kid at school, which I experienced also, because I was a singer and loved the stage. My favourite Wicked song is ‘Defying Gravity’. What is yours? It changes. I love singing them all, but Defying Gravity is one of my favourites. I would love to do a TV drama or soap. Go on a hot holiday, which I’m doing this week with my husband. On Twitter, you shared some lovely photos of birthday ‘boy’ Barney with your friends and fans. How important is Barney to you? He’s like the start of our family!